Jamie Dimon is now the only head of a major US Bank that was also in charge prior to the 2008 financial crisis. This is, at a bare minimum, somewhat of a testament to the job he’s been doing at the helm of the biggest US bank, which has seen its stock rise dramatically over the last 10 years. It also makes Dimon, a billionaire, a popular target for activists and protesters who publicly take exception with how the bank profits off of industries that they don't agree with. 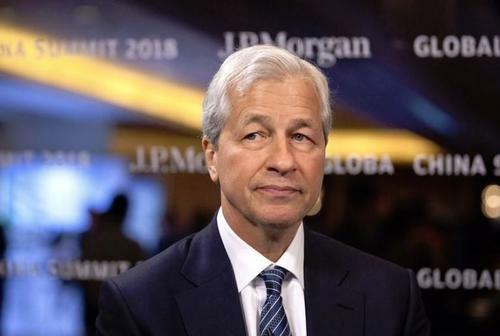 In short, Dimon is the new banking God of Wall Street - a title previously ascribed to Lloyd Blankfein who curiously departed the Goldman helm just as the bank's 1MBD troubles hit the spotlight - and that has made him an easy target. Dimon is taking it in stride. During Dimon's recent appearance at a community college in Ohio in November, one such activist wound up raising a banner on stage that said “Chase: Stop profiting off dirty energy.” Dimon responded in seemingly bemused fashion, according to Bloomberg, by adjusting his tie. Protesters that are following Dimon around are critical that the bank isn’t doing enough to fight an array of issues, ranging from climate change to private prisons to human rights abuses. 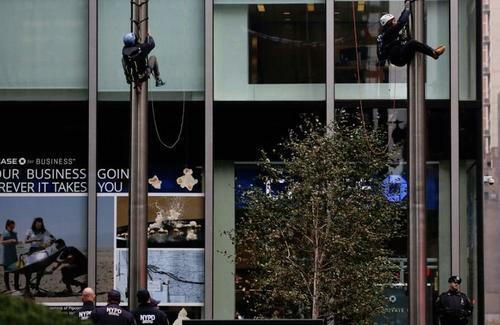 In addition to showing up at events that he speaks at, they have also scaled flag poles on Park Avenue, blocked Seattle traffic with teepees and played audio of crying children outside of Dimon's apartment. The activists have only become emboldened since Donald Trump took office. With Occupy Wall Street now out of Manhattan, the protest against Dimon represents one of the largest movements against anything in finance. It also could be a harbinger of what to expect if Dimon decides to run for President, an idea that has been tossed around, but one that Dimon has shown little public interest in. Moira Birss, an environmentalist who interpreted for Spanish-speaking activists at the bank’s shareholder meeting, told Bloomberg: "When government actors are ignoring their responsibility to listen to regular people who don’t have lots of money, these other avenues, like corporate actors, are all the more important. People like Jamie Dimon should welcome those opportunities." On occasion, Dimon appears to have had enough, and believes that the hijacking of meetings and disorderly conduct by the protesters overshadows many events that he goes to. “The shareholder meeting has become a farce,” he said back in October. Dimon, speaking in October at the Ohio community college, responded publicly by saying: "I don’t know why they’re following me around. Can I just make a point? I do think that climate change is an issue, and that the government should have policies to deal with the issue, including how you deal with fossil fuels over time. OK? I don’t think it’s JPMorgan’s job to decide what government policies should be about energy." Other protesters are rallying against JP Morgan's alleged unfair lending practices to black and Latino customers in New York. Dimon also took these complaints in stride. "You seem like a bright young man who is highly misinformed,” he said to one protester. Meanwhile, Dimon's credibility within his organization has grown since 2013 when, after Occupy Wall Street and the $6.2 billion London whale trading incident, Dimon managed to retain his position at the top of the bank. He’s also heading up major projects like tearing down the company's Park Avenue skyscraper to build a taller one and embarking on a national branch expansion initiative. Still, many protesters say that if Dimon goes into politics, they’ll be there to stand in his way. To be sure, there’s more than enough outrage from social justice warriors to go around and it doesn’t look as though protesting the new face of Wall Street banking leadership is going to be a hobby that misinformed "activists" are willing to give up anytime soon. Ruth Breech, from the Rainforest Action Network told Bloomberg: “We’ve just begun. Our goal was to get direct access and direct engagement with Jamie Dimon—see the whites of his eyes.” Good luck with that, Ruth: after all, there is a reason why Jamie Dimon is richer than you... and most other Americans.